2. In a bowl or large dish place almond flour and pepper. Mix. 3. Dip the chicken in the almond flour mix so that all of the chicken is coated. 4. Line a baking sheet with parchment paper and place the chicken on the parchment paper and place in the oven. Let bake for about 35 min, flipping the chicken over halfway through. 5. In a small sauce pan add the spiraled zucchini (“zoodles”) and cook on low to medium heat for about 5 minutes just to heat. Then drain the zucchini. 6. Heat the tomato sauce and add to the zoodles. 7. When the chicken is done place on top of the noodles and sauce. Garnish with chopped basil and nutritional yeast. 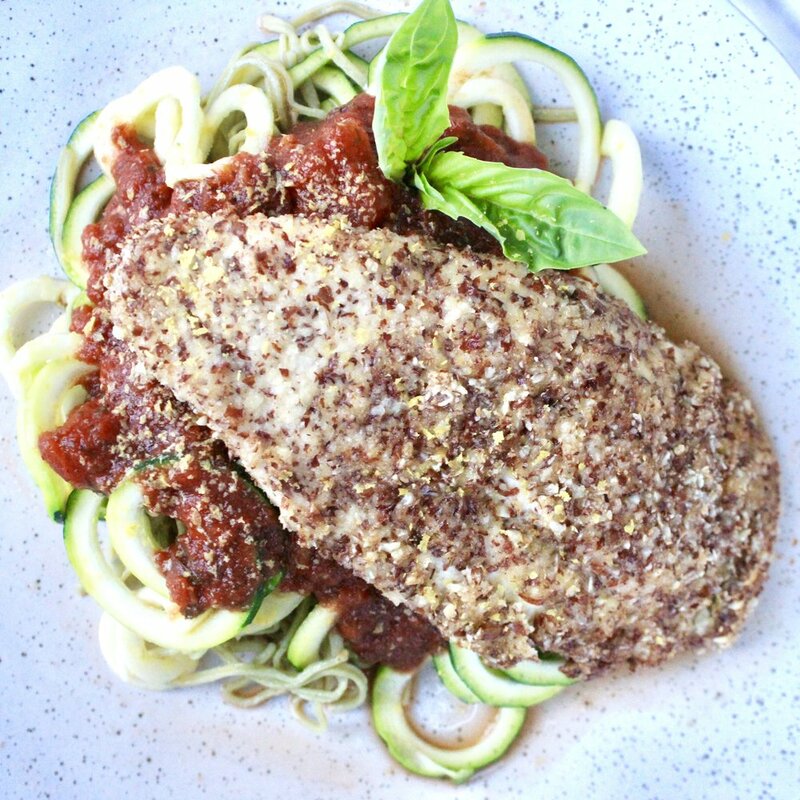 This is the only way I make chicken parm now.I love how hearty the almond flour is and that it’s lower in carbs than traditional breadcrumbs. If you’re still getting use to zoodles mix half spaghetti, half zoodles. Either way this dish is delish without leaving you feeling like you want to dive into a food coma!